Here, we will walk through warfarin skin necrosis, and in the process, deepen our understanding of the coagulation cascade, one of the most dreaded topics for medical students on the USMLE Step 1. Then, at the end, I will give you ready-made Anki cards that you can put directly into your Anki deck. Explain what paradoxical effect can happen if you give warfarin alone. What can do you do to prevent this, and why does it work? Explain the basis for warfarin skin necrosis using the coagulation cascade. What population is this typically seen in? Factor V Leiden – classic presentation? Here, we will see how answering these questions will help you solidify topics you need to know (warfarin skin necrosis, paradoxical effects of giving warfarin) while helping your recall important details for the USMLE Step 1. Coagulation is making a clot. What are the two components of clotting? Primary hemostasis (platelet plug formation), and secondary hemostasis (coagulation cascade). 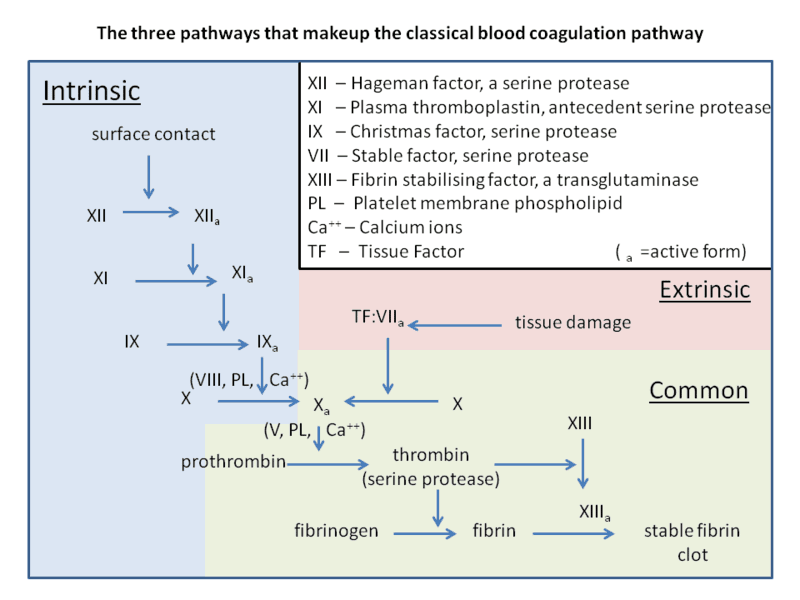 What is the purpose of the coagulation cascade? What are the components of the coagulation cascade? There is the extrinsic pathway and intrinsic pathway. These both lead to the common pathway. Why is it called the coagulation CASCADE? Many coagulation factors are zymogens (inactive proteins) that cleave downstream factors to activate them, which then cleave downstream factors. For example, Factor XII, when cleaved, will activate Factor XI by cleaving off a small fragment from it, which will then cleave Factor IX, and so forth. What factor(s) make up the intrinsic pathway? Factors XII, XI, IX, VIII. What factor(s) make up the extrinsic pathway? What comprises the common pathway? What are the functions of Protein C and Protein S? What determines whether there is a clot formed or not? What is the mechanism of warfarin? Inhibits the action of vitamin K, which γ-carboxylates glutamate residues on factors II, VII, IX, X as well as protein C + S.
Of the factors carboxylated by vitamin K, which have the shortest half-life? What is the half-life of Albumin? Where is it produced? Relatively long half-life (~20 days). Produced in liver. It is strongly recommended that you attempt to answer the final questions by yourself first, before looking at the answers. Remember, the USMLE Step 1 exam will test your ability to make connections on the spot, the more practice you have, the higher your score! Then, when you think you might know the answer (or are completely stumped), look at the answers below! Look for the original questions below! NOTE: I have added “reverse” questions to make adding it to Anki easier. Thus, you will see words in the question that weren’t in the original questions – they are intended to be the answers to the “reverse” questions. Factor V (pro-coagulant) is resistant to inhibition by activated protein C (anti-coagulant). Thus, this will make you MORE prone to clots. Factor V Leiden - classic presentation? What would be the effects on albumin + PT of acute liver failure? Why? What would be the effect on albumin + PT of chronic liver failure? Why?